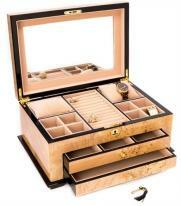 Maple is a hard and durable wood perfect for creating fine jewelry boxes for jewelry and watch collections. Our maple wood jewelry boxes feature attention to detail, locks, plush linings, watch pillows, earring and cuff link compartments and trays. Many maple trees have valuable timber and some have a highly decorative wood grain. This condition occurs randomly in individual tree species and cannot be detected until the wood is sawn. Birds eye maple is one of the distinctive patterns. Questions about a maple jewelry box? Give us a call or send an email. We're here to help. All maple jewelry boxes qualify for easy 30 day returns and 1 year product warranty.